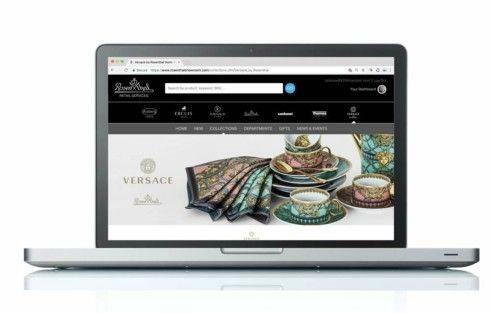 Rosenthal USA, a subsidiary of Arcturus Group, launched a new wholesale website for its family of brands Rosenthal, Versace, Raynaud and other premium brands on November 1st, 2018. The company's retailers and sales reps can login to the mobile friendly website and view real-time stock levels, wholesale pricing, and price lists. The website adapts to the user's country and shows US or Canadian prices and documents. "This website is an excellent tool for our retailers to quickly access products within the Arcturus family of seven brands. They can do this from their desk top, mobile phone, or IPAD," said Marisa LeDonne, Vice President of Retails Sales ~ US and Canada. In an industry first, retailers and reps use a 'universal' login. Pre-approved businesses can login once to Rosenthal's site and easily browse to DeVine Corporation's website, Pickard China's website, and Bridge Catalog's network of websites--and vice versa. "A new website often means new passwords and usernames. During these transitions, brands lose business. With Bridge's Universal Login, retailers and sales reps have instant access and are able to get their work done without going through any new sign up process." Bridge brought to the table a decade of experience in creating wholesale sites for premium brands. Bridge and Rosenthal met regularly to discuss the design and function of the wholesale site. This attention to detail ensured the website met Rosenthal's goals. Rosenthal's new wholesale site launched to the U.S and Canada markets November 1st, 2018. Bridge designed the new site for mobile use by sales reps. The new website is responsive to all devices including mobile phones and tablets. Reps can view real-time stock from their mobile telephones. Wish to create a new wholesale website? Building a new website can be stressful and expensive. Working with a trusted company makes a world of difference. Bridge can quickly and easily build your new website for you.